Right perception consists in seeing the true nature of every substance of the universe. Jainism advocates that one should first try to know, comprehend, and understand the nature of reality, one’s own self, religious goal, and the path. One should analyze it, examine it, test it, and verify it, and then, if satisfied, be convinced of its truth and efficacy. Right perception or faith makes us realize the reality of life and the seriousness of our purpose in life. Right knowledge is the true, correct, proper, and relevant knowledge of the reality, the tattvas. Philosophically, this is known as the theory of non-absolutism (Anekantavada) and calls for an attitude of openness. Our limitations of knowledge dictate a style of relativity. The style of Syadvada allows no room for assertions. 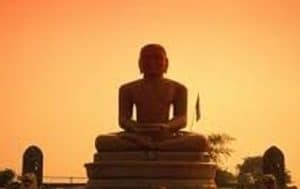 This Jain theory of knowledge, incorporating the two principles of non-absolutism and relativity, has made an esteemed contribution toward liberalizing the mind of human being. Proper, correct, appropriate, and truly natural conduct of the living being (soul) is known as right conduct. The main purpose of a human being is to free himself from attachment (raga) and aversion (dvesha). That is to be free from all impure activities of thought, word, and deed. This will attain the state of perfect equanimity. For practical purposes, right conduct comprises ethical codes, rules, and disciplines which an aspirant is required to pursue the ultimate freedom. This resolves into taking the five vows of an ascetic or householder.